You are never more alone than when you are in a crowd filled with disingenuous people. You are never more at peace than when you’re connected with another highly empathic being. You seek comfort in the words of people who understand complex and abstract ideas. Your energy is often drained by those who lack empathy and compassion. It is revived by those in your tribe who truly get you. You are often the first to “know” and “sense” when there is something off about someone or a situation – an alienating experience when no one else is there to validate it with you. You long to be “normal” but belonging in any group usually means sacrificing a part of yourself, and while sacrificing yourself for others is your forte, it’s not one you can risk when it comes to your integrity. You get a natural high from communicating from the deep center of your highest truth. You drag yourself low when you are placed off-center by those who try to feed you falsehoods about yourself and others. You can get derailed easily by the toxic vibes of others and put back on track when absorbed in your inner voice and guidance – or perhaps by an uplifting message from a friend who genuinely cares. True friends and partners are hard to come by but when they do come along, they are cherished and thoughtfully tended to – mindfully and graciously, each and every time. Your interactions with other empathic beings are sacred ones and you honor them with a loyalty that might surprise others. Relationships with others can result in spiritual transcendence or spiritual blockages. You’re overwhelmed by the hatred in the world; bullies, predators and naysayers can make a meal out of your emotions. They feast on your sensitivity and your perceived gentleness. Yet these people tend to be your greatest teachers and incentives for personal growth and transformation. Beneath the gentleness, there is a fiery, complex, multifaceted being, waiting to set the world on fire with his or her truth. But you reveal yourself by layers – one by one – and it can take a lifetime for someone to really know you. Some never do. Sometimes, you’re not even sure you fully know yourself. You try to find the meaning in everything, and your soul feels most fulfilled when you are giving back with what you’ve learned through your experiences and the endless dialogues you have with yourself. Pondering the world, pondering the intentions and motives of others, and your place in the universe. You feel the sacred connectedness of every action, every reaction, and every person that comes into your path, because you intuitively understand that they are part of your life’s journey. In your world, synchronicities are miracles and you are hungry for deep connections with others. No matter how weak or overwhelmed or helpless you’ve felt, you move through the world with a quiet resolve, an inner strength that is unparalleled for the adversity you may have faced. This is what it’s like to be an INFJ (the Myers-Brigg Personality type indicating a person who is introverted, intuitive, feeling and judging) who is also an empath. Being an empath doesn’t mean you are necessarily an INFJ as empaths can be from a variety of personality types, but INFJs tend to be natural empaths. Due to our high sensitivity, eerily on point intuition and rich inner worlds, we have a lot to give to the world as the rarest personality type. We find unconventional and conventional ways to share our gifts in ways that can change the lives of others, including our own. We tend to be the healers of the world. Yet the world takes a lot from us, quite easily, and we usually need a great deal of solitude to recharge. Empaths soak up the emotions of others. They tend to become enmeshed with other people’s identities. They get tangled up in the energy of other beings very easily. They are also very attractive to a wide variety of people because they’re authentic, sensitive and good listeners – so they attract both good people as well as toxic ones who tend to take advantage of their compassion. While being an empath can be exhausting, it is also a gift to be able to connect and heal others. It is a gift to be immensely intuitive, to connect to the pain of others because we tend to have the most nourishing relationships with people who are also empathic. Many empaths who are also INFJ’s benefit from using their gifts in professions that heal, care for or counsel others. Being an INFJ empath means we have to protect ourselves very carefully and wisely. Because empaths have such porous boundaries in terms of how they’re enmeshed energetically and emotionally with others, it’s important to filter out negative, toxic people as well as negative energy by giving ourselves some sacred vows to live by in terms of what we will and won’t tolerate in our relationships. 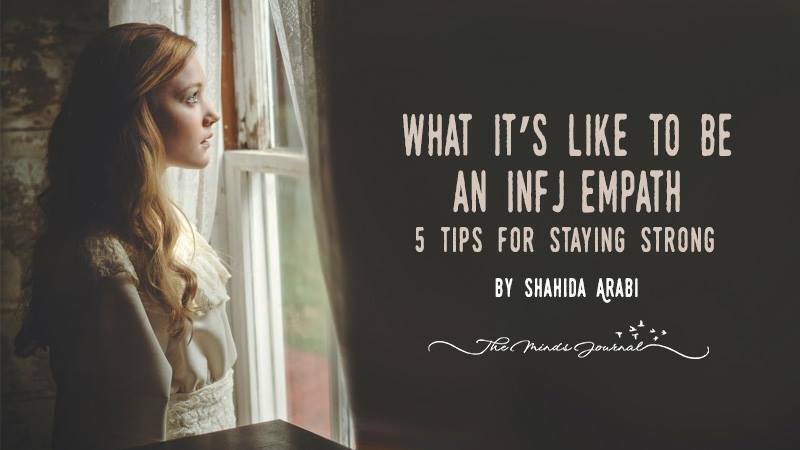 There are five tips that I’ve learned from being an INFJ empath that may help in resolving a notorious inner conflict we experience: save the world or save ourselves? The answer lies in both – saving the world while creating very strong boundaries that will ultimately save ourselves.